Did you have a good Halloween weekend? We celebrated my dad's birthday on Saturday and went to Kitchen Kettle Village in Lancaster (they have the cutest country shops and cafes). It was the most beautiful fall day! 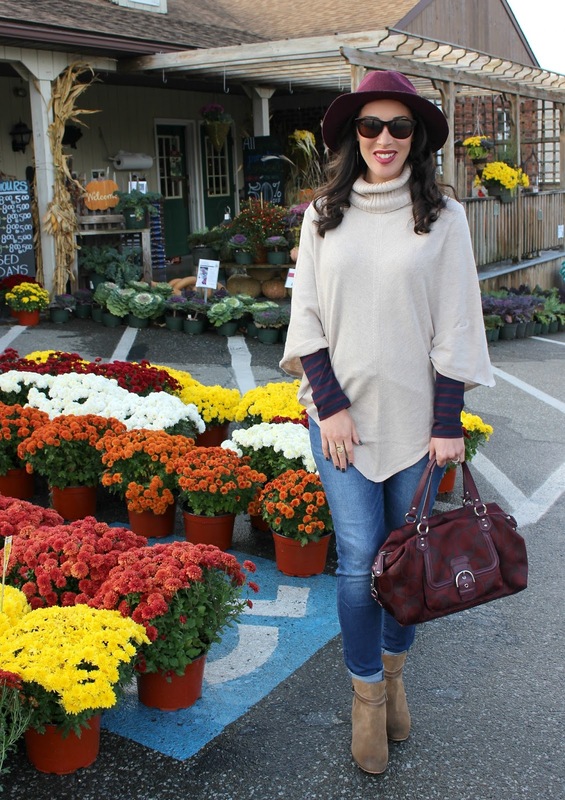 We snapped a few outfit pictures while we were there at a nearby landscape nursery. Ponchos are trending again this season and they are perfect for layering during the transitional fall weather. I particularly like this poncho because of the turtleneck style. It stays put and doesn't fall off like ponchos that drape over the shoulders. I love the way those ponchos look, but they just aren't as functional! I bought this poncho at the Ann Taylor outlet recently, so if you live near an outlet, they should still have it. If not, I found a very similar one at LOFT and it's on sale! It's an extra 50% off right now (no code needed), bringing it down to $55. 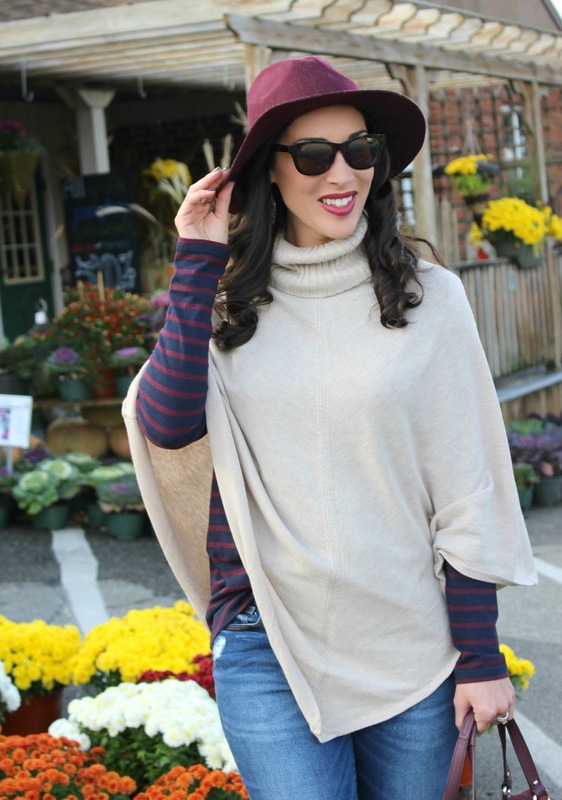 This striped crewneck tee was the perfect choice to wear under my poncho. I love the light/dark color contrast! Navy and burgundy is an unexpected combo and I really like the colors together. 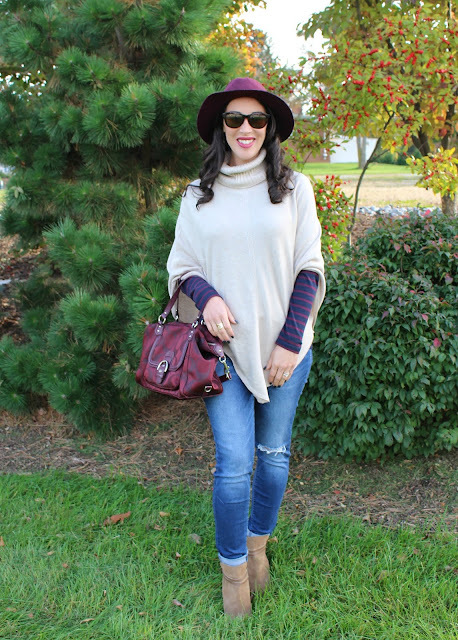 This tee is at Nordstrom for only $19 and looks cute alone or layered like I did here. It runs big, so size down. For jeans, I wore my Mid-Rise Rockstar Skinny Jeans from Old Navy. I LOVE these jeans and highly recommend them. They are only $27 and all sizes are available! A good shoe choice for a fall outfit like this is a neutral bootie. I wore my favorite booties that I purchased during the Nordstrom Anniversary Sale (they are so comfortable...I lasted all day walking around Kitchen Kettle Village). Unfortunately, they're no longer in stock, but the BP. Trolley Bootie is very similar. I carried my burgundy Coach satchel to match the burgundy stripe in my tee and the fedora hat. This bag is gorgeous and I love the metallic C's. You could also carry a neutral bag with this outfit. My Coach bag is old, but I linked similar bags at different price points below. Finally, I tied the burgundy colors together with my Steve Madden fedora hat. 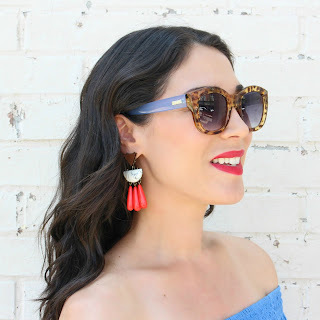 I bought this last winter at T.J.Maxx and it goes with so many pieces in my wardrobe! 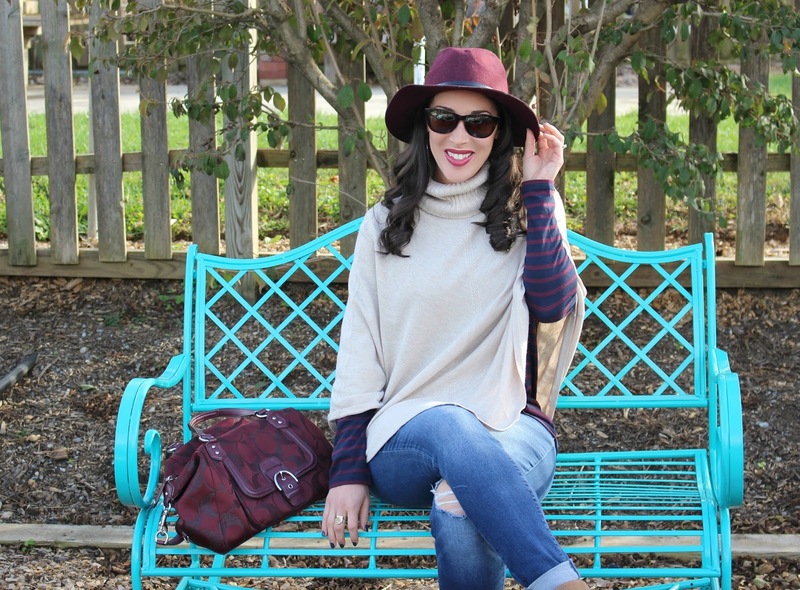 Fedoras are a very stylish accessory to any fall/winter outfit! Here is a similar hat at Forever 21. Great fall look! I love the stripes peeking out from your poncho! So pretty! 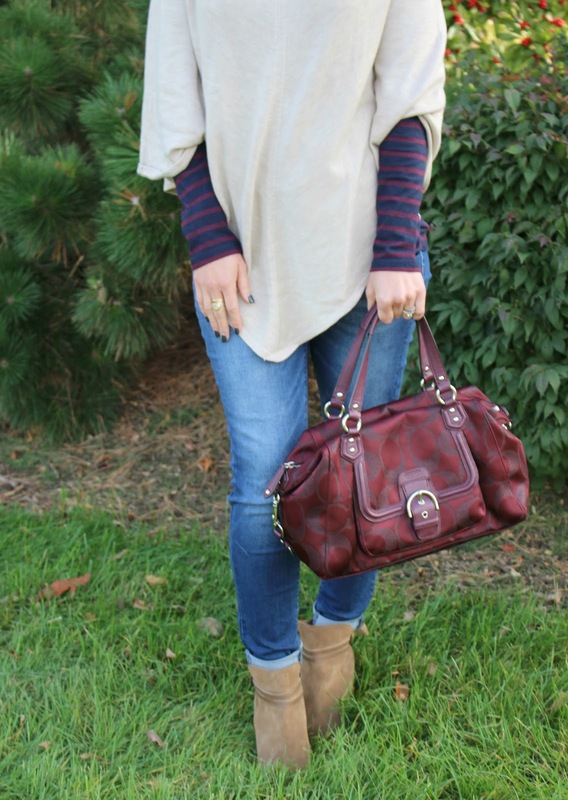 This is such a GREAT Fall look!! 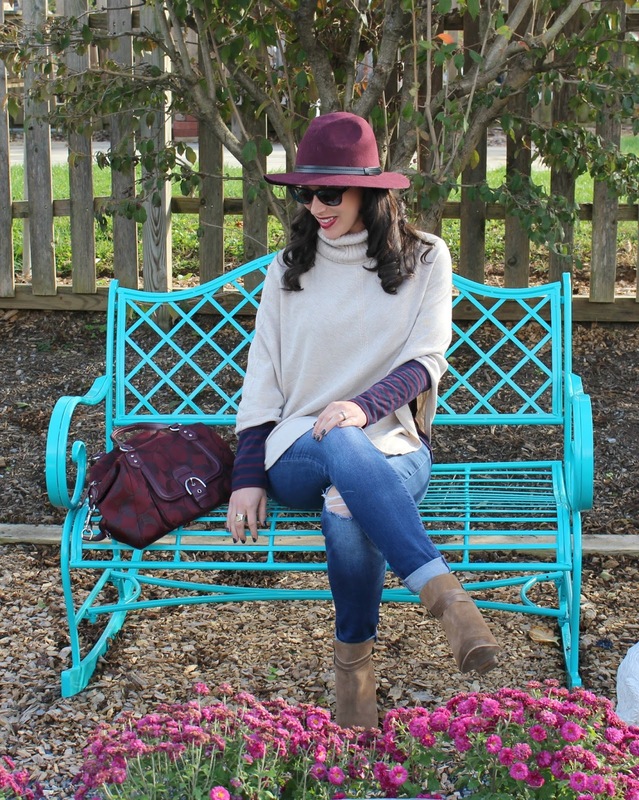 I love the poncho and my other favorite element is that fabulous burgundy hat. You look AMAZING!! What a gorgeous fall outfit! I could see myself wearing this daily. Ha!! ;) Love the details in all the pieces in this outfit! You look so great in that hat! I can't wait until my hair is a bit longer so I can wear hats again. Omg, I'm in love with that poncho with the striped shirt. I could live in this look. So fall and so cute. I'm loving how you styled the striped top underneath!